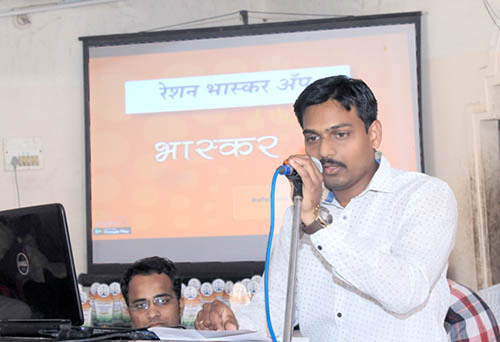 Mr Aniket Pangavhane -Director ,Reformist India IT Solutions Pvt Ltd Addresing Fair Price Shopkeepers in Akola District.He says Ration Bhaskar app helps fair price shopkeeper to develop their work and go digital. Maintain their fair price shop data and their unit register. It displays accurate information about ration card holder information and graphical representation of database.